Volume-Tone Pedal Reissue, Volume Pedal for Guitar/Bass from Fender. Though not as well known for their pedals as they are for their guitars and basses, Fender has been making classic pedals for more than 50 years. Following the recent re-issue of the Fender Blender Custom pedal, Fender decided to launch a range of new classic-inspired stompboxes with some vintage tones and looks. Let’s take a closer look…. This is a volume pedal that I have been borrowing from a friend of mine. Volume pedals tend to be pretty divisive amongst guitarists, some of whom would rather use a pedal and some who would rather use their guitars volume knob (if they have one). The cool thing about this volume pedal is that there is no need for a battery or power supply, since it has no pre-amp and doesn't need to be powered in any way. This pedal is in no way capable of being edited with MIDI or a computer and isn't rackable. There couldn't be an easier pedal to use than a volume pedal, and this one is no exception. Two 1/4" connections, in and out. There is absolutely no reason to need a manual for this pedal as it's simple to use. To change the volume of your instrument, there isn't much to do besides slide the pedal back and forth on the rocker. This can be used simply to adjust the overall volume throughout a song or set, or can be used for effects like volume swells and tremolo. The great thing about this pedal is the fact that you don't lose any tone when the volume pedal is brought back. I've bought lesser pedals that rob me of some serious tone when I need to bring the volume down for rhythm playing. That would really frustrate me, especially when playing my Stratocaster, which has a great tone but can be somewhat unmanageable sometimes. The main frustrating part is that I was unhappy just using the knob, but I think that it worked better than most pedals. With this pedal, there's really no loss of high end, which is the crucial element to my Strat's twangy bright sound. While this problem was always less pronounced with my hollow bodies and other electrics, the difference between this pedal and my old Morley volume pedal was astounding even when using these guitars. The other benefit is that the pedal moves far more gracefully than that one did, it's got the perfect amount of resistance in that it's not difficult to move but it's also hard to overshoot your destination while playing. I like the simplicity of this pedal, as well as the fact that it doesn't rob me of tone. There's not much to complain about, if anything at all. The price is pretty reasonable for most retailers that I have seen so I would say get it if possible, it's definitely not a bad pedal by any means. 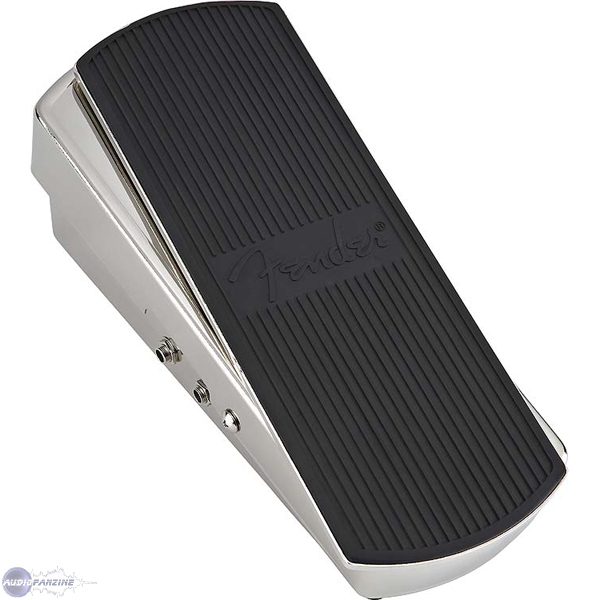 The Fender Volume Tone is a volume pedal made for electric guitars and basses. It is quite basic in make up and is pretty much the same as most volume pedals out there. It has 1/4 inch connections and doesn't require a power supply or battery because it is a volume pedal and isn't rack mountable. Like most volume pedals are, the Fender Volume Tone is incredibly easy to use. Simply plug your guitar into the input and your amp into the output and you are good to go. All you have to do is press the pedal all way down to turn the volume all the way down and press it up to keep the volume up. This provides you with a ton of options beyond just basic volume drops as it can be used in a variety of different creative ways. While the Fender Volume Tone doesn't have a sound of its own, it is good to know that this pedal won't color your sound at all and simply will give you control over your volume with your foot. I tend to use the pedal for a few different effects beyond just turning the volume up or down. This pedal is great for volume swells for electric guitar and especially for lap steel and pedal steel and can also give you a pretty cool tremolo sound but you have to constantly move the pedal up and down to do this, which can be somewhat difficult. The bottom line is that the Fender Volume Tone won't change the sound of your original signal, which is all you can really ask for in a volume pedal. I've been using the Fender Volume Tone on and off for a few years and it is definitely an adequate volume pedal. It is well built and has the Fender label so you know you are getting a good product. 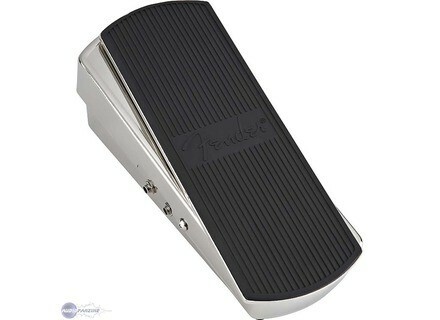 If you are looking for a reasonably priced volume pedal, you really can't do wrong with the Fender Volume Tone. PDAL out the late 60's, with his colleague, the fuzz-wah. Limited success. Removed from the Fender catalog for over 20 years. So why it appears? But because we are in the mode of "vintage"! While this is REALLY pedals? The quality and finish are srieuses. The chromium is prsentation trs beautiful and the cover in felt Fender logo adds a touch chic. Trs simple: on the volume rocker on the turntable Tone. The pedals are heavy and imposing. Trs impressive. The inertia switch is far from being a ngligeable. Tiring when used intensively and a little handicap for precision. But we are talking about a volume pedals. So it's not serious trs. Whether for the volume or the Tone Controller are prcis and sensitive. The PDAL is transparent. The Tone Corrector is simple but of quality. This is not a 10-band equalizer, but it allows for the effects of tonality much fun playing at the foot of the dernire. 10/10 difficult to see the "effects" on offer. But this PDAL fulfills its mission. Good volume pedals. Well built, although Submitted. The switch handle is quite heavy, but nothing major. His most? A passive Tone Corrector contrlable foot at the same time as the volume. A simple but ide INTERESTED. Rvolution not, but between a single volume pedals and this MODEL, the choice will be easy on this dernire. Volume pedal and tone, analog. The connection is simple: An input, output, and an output bypass to connect a tuner or other non-standard configuration (or even bi-amplification with / without effect for the recording studio. Configuration is very simple: NOTHING IS SET! You plug, you play! It's plug'n'play. You lean forward to increase the volume, backward to decrease, you turn left to go to the grave, to the right to go to the treble. The manual ... What for? The effects are effective, even if we would have liked a broader tone of race, but it still allows for very nice effects, and it can correct a small problem of the presence or excessive treble. I use it with several guitars. Before, I put a wah-wah and distortion pedal. After, I put a compressor (some advocate before the distortion, but the sound I'm looking for is after the comp). The delay is in effect loop, so my repitition are not cut through the volume pedal. It is very transparent, without breath, without cracking, the increase in volume and tone is steady. In short, that's good! - The size large enough. I have not tried other models before buying. I consider the RAPORT price / quality good. With experience, it is a choice I would do, it makes the job much to do and it is solid.